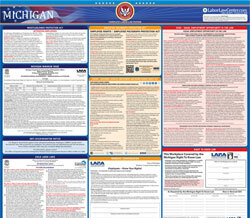 The Information about Unemployment Benefits is an unemployment law poster by the Michigan Department Of Licensing and Regulatory Affairs. This is a mandatory posting for all employers in Michigan, and businesses who fail to comply may be subject to fines or sanctions. This poster must be posted in a conspicuous place where all employees will see it. This poster describes who qualifies for unemployment benefits as well as how and where to file a claim as well as what payment options are available. It appears you don't have a PDF plugin for this browser. Please see the link below to download michigan-uia-uc1710-76109-7.pdf. you become unemployed, this information may help to determine your unemployment benefit entitlement. • File a claim, and report for benefits as directed by the Unemployment Insurance  Agency (UIA). • Register for work each time a new, additional or re-opened claim is filed as directed by the UIA. • Have sufficient earnings in the past 18 months. • Be able to work. information (mailing address and telephone number) and respond to all UIA requests to update your contact information. benefits as state law requires that you produce evidence of those wages (pay stubs, W -2, employer payroll records, etc.). • Be actively engaged in seeking work. efforts as directed by the UIA. name, employer payroll record, or W-2 Form. 2. Your Social Security number, complete mailing address (zip code), telephone number, and county of residence. 3. Your driver’s license or state identification card. If you miss your assigned day and time, claims are accepted on Thursday or Friday from 8:00 a.m. - 4:30 p.m. ET. UIA 1711                                                                                                                                                                                                                                      Authorized by(Rev. 03-17)                                                                                                                                                                                                                         MCL 421.1, et seq. information is available for the worker listed on this form. • You have worked under only one Social Security number. • You have not filed a claim for unemployment benefits against another state during the past 1 2 months. available when you file your claim. 366-0004). UIA staff is available to assist you from 8:00 a.m. to 4:30 p.m., ET, Monday through Friday. TIA is an Equal Opportunity Employer/Program.